THE TAYLOR DIARY: Therapist Thursday- Divy it up, Yo! Mani Monday: I will talk about the latest nail trends and/or feature my manicure of the week. This will force me to keep my nails in shape and have fun with them. I always like trying new colors and I'm about to get funky with different designs. Stay tuned all you #notd lovers. Therapist Thursday: I am a firm believer in talking about what is going on in my life, good or bad. I feel if you address things up front and openly, they don't get put on the back burner and you can continue to work on things to better yourself. I will try not to go too into detail but I have found from reading when other bloggers address a struggle or something they are dealing with, I can totally relate on some level and in some way I am helped by it. Just wait until you read today's Therapist Thursday. Holy COW. Why didn't I start this 9 months ago!!? Feature Friday: I'm going to highlight a blog I'm loving at the moment! This particular blogger might not even know I am highlighting them, but oh well! I love discovering new reading material so hopefully you will too! Free advertising...woohoo! Street Syle Saturday: Today I will feature what I wore for my weekend/Saturday adventures! It may not be up until the evening but make sure you watch for it! I mean seriously. How amazing is this?!? This is a menu (if you will) of literally everything we have to do to keep up a house. Why in the heck would I continue to torture myself with leaving this to one day to complete? No wonder I am so overwhelmed all of the time. There are at least 2 things each day to complete..perfect for dividing between my husband and me. What do you think readers? Would you do this schedule or would you rather leave it all to one day? Or heck, would you rather just stop all together. It is so tempting, right? The floor is open for comments. Ready. Set. Go. I made one of these but it was a bit more detailed! 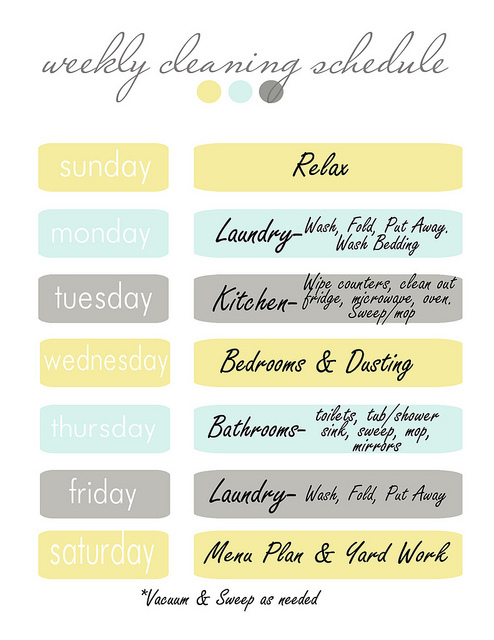 I may need to do this simplistic cleaning chart and see how that works out!!! I love all your daily posting ideas!!! And I completely agree with feeling overwhelmed. Im always striving to be the best wife I can be and juggle EVERYTHING! It gets to be too much sometimes to the point that I have breakdowns!!! 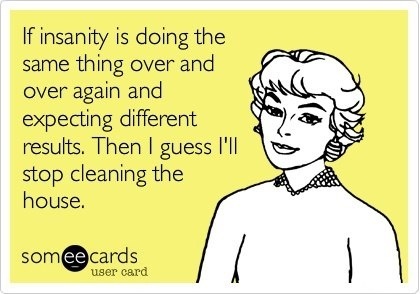 I hoping delegating more tasks to the hubby will help me!! I love delegating. Seriously, it's awesome. (My husband may not think so, though.) Hope you are having a good week! L.O.V.E. this! I think we'll be adopting this at our house ASAP! I just had to make a schedule like this for myself as well - for all the same reasons. Keeping up with housework is the first thing that goes when I am feeling stressed. 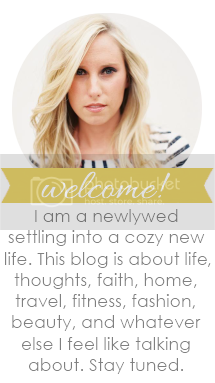 You've inspired me to blog about it (also feeling a little uninspired in that department too).